Welcome to my blog! For those of you that do know me, you’re probably smiling because you’ve heard my global-justice-through-land-tenancy spiel at least a dozen times, and you’re impressed/relieved that I’ve finally created an outlet outside of your ears by which to spout my sapience. For those of you that don’t know me, double-welcome! I hope my past adventures will spark your curiosity enough to keep coming back, because I have a whole two years of new adventures in store! Here’s the basic gist on what’s to come: on September 1st I will be flying to Hangzhou, China where I will begin a China Studies Master’s program at Zhejiang University with a full government scholarship. While I am pumped on the master’s program, I am doubly-pumped on the opportunity to continue my field research from undergrad, detailed below. I’ll have a follow-up post with how my research has evolved and my new plans for this next iteration. Through my undergrad program, LIU Global (check it out – 3.5 years of study abroad in various countries around the world! ), I spent two years at Zhejiang University in Hangzhou, China. The first year (September 2008 to June 2009) was pretty much a Mandarin wrestling match, but by the time I was back for round 2 (from January to December of 2010; Sept-Dec of 2009 was my India land-use adventure that I’ll have to fill you in on sometime too) I had pinned that sucker down and was ready to delve into the burning questions I had on China’s rural land-use: how do farmers want to use their land? Is the way they want to use their land aligned with the government’s land-use strategies? Are international interests influencing the government’s domestic land-use strategies (this last one is really a two-sided question: how and why are international interests promoting China’s transition to privatization, and is China’s interest in foreign resource development, especially in Africa and Latin America, influencing their domestic land-use decisions)? From Jan-May of 2010 I read a lot of literature on the subject. Like, so much that even my week-long stint in the hospital ended with a book fortress around my bed (my hospital adventure and inside glimpse of the international clinic vs. Chinese hospital is another crazy story I’ll have to share one of these days). By May I was ready to get out in the field and began by picking tea alongside a group of migrant farmworkers (all women) who had come to a tea farm in Hangzhou from the inland province of Anhui (I hope through my new adventures to talk more about the coastal farms’ hiring of inland farm laborers). In July I traveled to a mountain called Daping, outside the capital of Chengdu in Sichuan province. There, I interned at an environmental NGO, Global Village of Beijing (GVB), and met my friend Peng, who then took me to his parent’s home high in the northern mountainous region of Aba, and the epicenter of the 2008 earthquake. I spent the week climbing thorny trees alongside Peng and his parents, picking a spice called huajiao that is used in traditional Sichuan dishes. 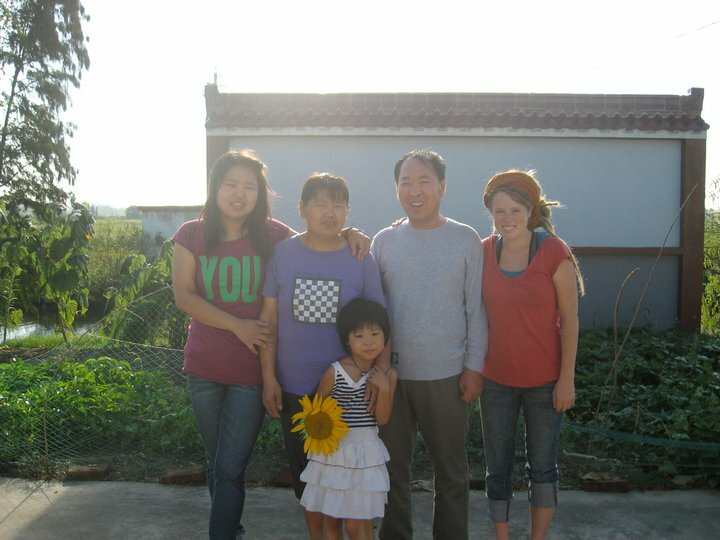 Here’s my friend, Cheng, and me with the local kids that lived on the mountain where GVB is located. One of our jobs was to prepare presentations, including teaching songs about recycling to the kids, for the tourists that came to see the work the NGO was doing (the head of the NGO, Liao Xiao-yi, is one of China’s best-known environmental activists who was the Green Ambassador to the 2008 Beijing Olympics). 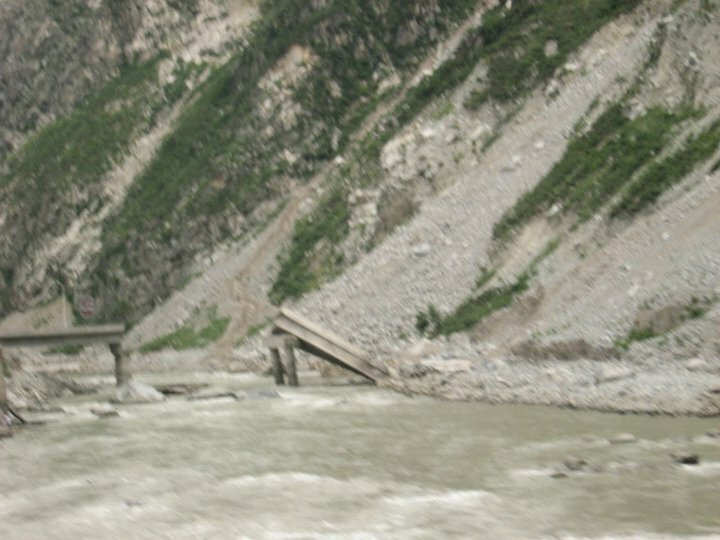 On the drive through the mountains to Peng’s village, the devastation from the earthquake that hit more than two years earlier was still evident all along the roads- here’s a bridge still collapsed. Peng’s dad and I picking Huajiao in the trees. 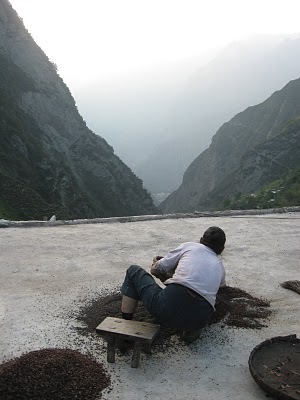 With the last bit of light for the evening, Peng’s mom spread Huajiao out to dry on their cement rooftop. Nearly everyone in the village relied on this cash crop for their primary income. Quick Side note: Peng’s village was decimated during the earthquake, and in the aftermath when many of the men were hired on reconstruction projects outside the village, Peng paid a woman from a neighboring village to come and train the women in his village in the art of a making traditional embroidered handicrafts. He paid all of the women’s salaries, and then bought everything they produced and took the products to Beijing to try and sell. Unfortunately, he was unable to afford the rent of the shop in Beijing, and returned to Sichuan to work at GVB without having recovered much of his investment. While I was staying with his family, Peng gave me some of the handicrafts the women had produced to take with me and try to sell back in the US. I displayed Peng’s crafts in my ‘community-based’ high school’s clothing store that teaches students business skills while providing a revenue stream for the school (you can check out my awesome community-connected high school here: http://www.tnsk.org/). It was just a few months ago that all of Peng’s crafts sold and I was able to send him all of the profit. Hooray! Ok back to farming: from September to December of 2010 I contacted farmers using the World Wide Workers on Organic Farms (WWOOF) program. 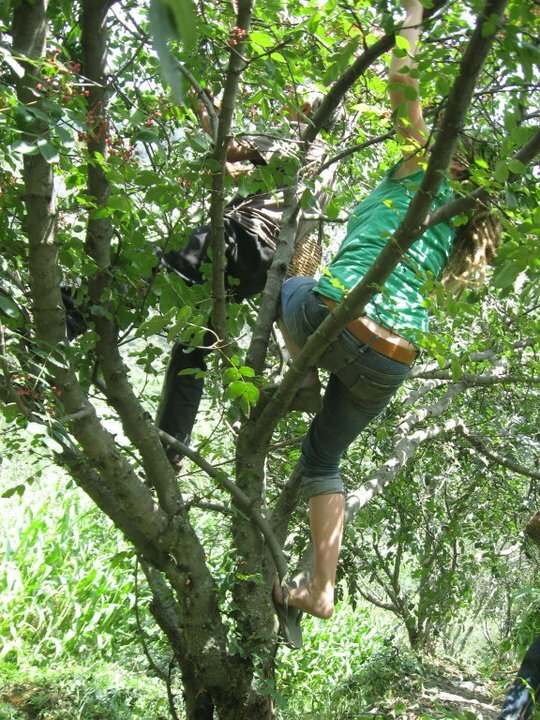 China has a pretty unique situation with WWOOF in that if you are a rural citizen (and citizenship in China is divided between urban and rural) you are allocated a plot of land through the collective (I’ll dig more into this in later posts). 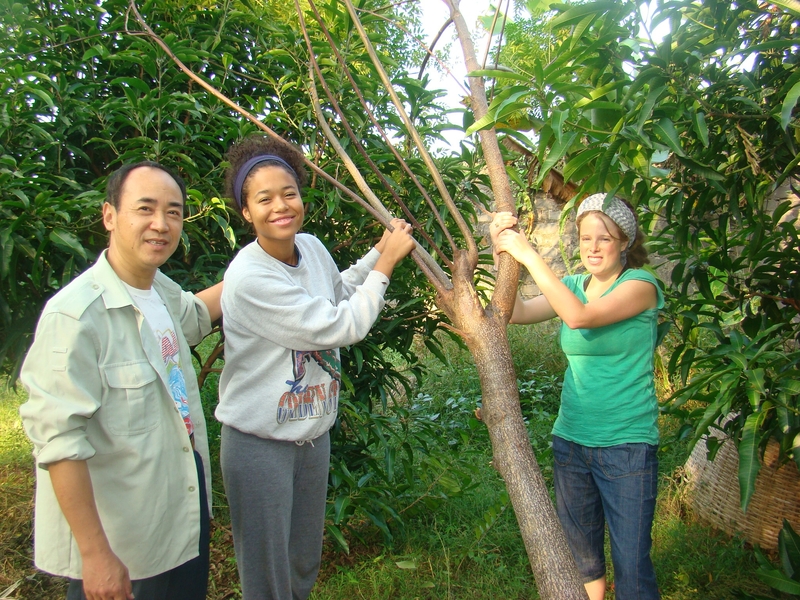 So hypothetically any rural Chinese family can sign up to host people who want to come help them farm their plot (China is the only country where WWOOF doesn’t require the farmers to actually be organic). 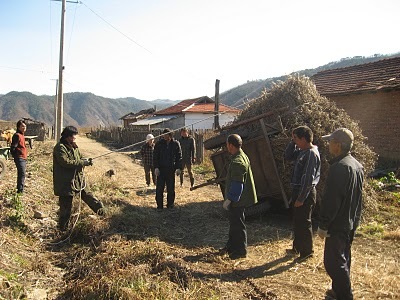 Nevertheless, there was no bum rush of WWOOFers dying to get out to rural China– I was the first WWOOFer all of my families had hosted, and in one case I was even the first western foreigner the village had seen (when explaining that I was from the US, I was routinely met with disbelief and questions of whether I was a Uyghur from Xinjiang). 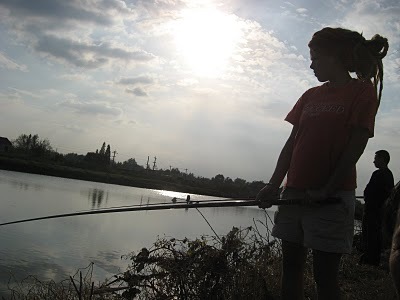 My host family and I caught fish on the local fish farm for dinner; price for fishing that evening: one pack of cigarettes paid to the fish-farm boss. Here’s me (guess which one) with Julie (far left) her Mom and Dad (middle) and their next-door-neighbor (sunflower girl). My ‘host brother’, Yang, and I helped turn over a family’s trailer that had tipped from the weight of brush. This family, like most families in the village, was preparing for winter by gathering dried corn stalks and sticks to feed their cows and use as firewood throughout the winter. My host family’s house.The front fenced area was for the goats. 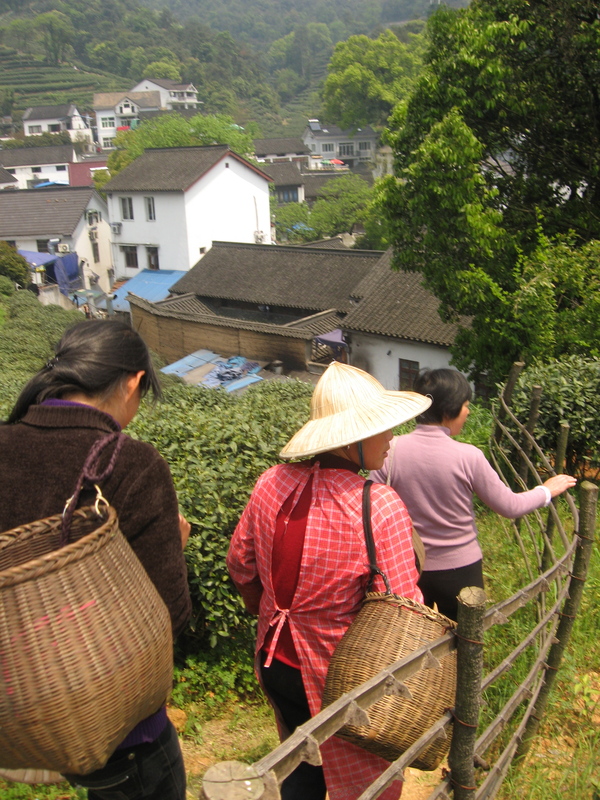 My third WWOOF visit was to a tea farm in Suichang, a rural village in Zhejiang Province. 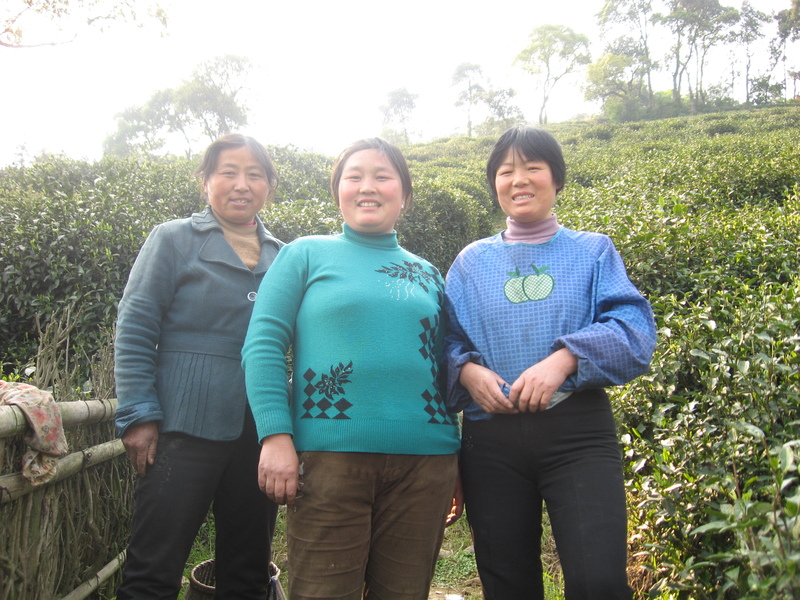 The family: grandparents, mother and father, and two young girls, hired laborers from more remote villages to help pick tea while they ran the tea processing plant. When I returned to their farm two months later, the mother and father were partners in running a hotel and restaurant business while the grandparents were running the tea farm and looking after the grandkids. These women traveled from their remote villages (leaving their families behind) to live on the tea farm and work 12 hours days during the harvest season. 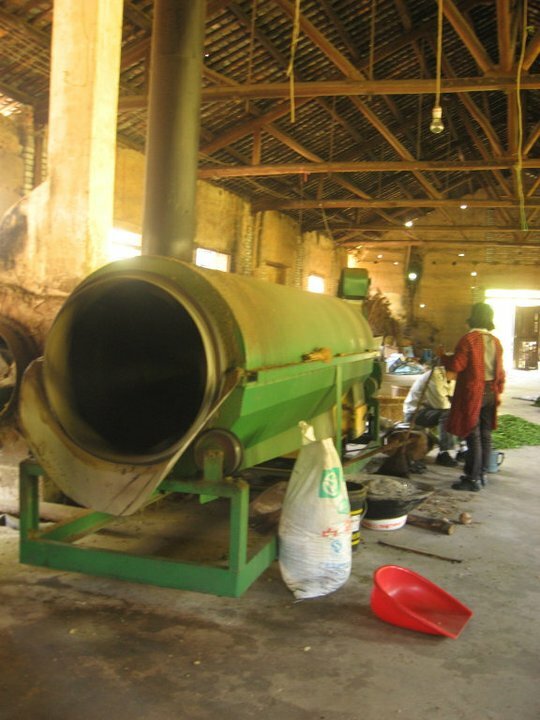 Here’s my host mom with the tea processing machine – they fed the leaves through the far end where they cycled around at high temps before being burped out the hole on my end, where I gathered the leaves into piles to be fed back through until they were well burnt. Here’s a view from a perch on the hilltop just above my host family’s house. 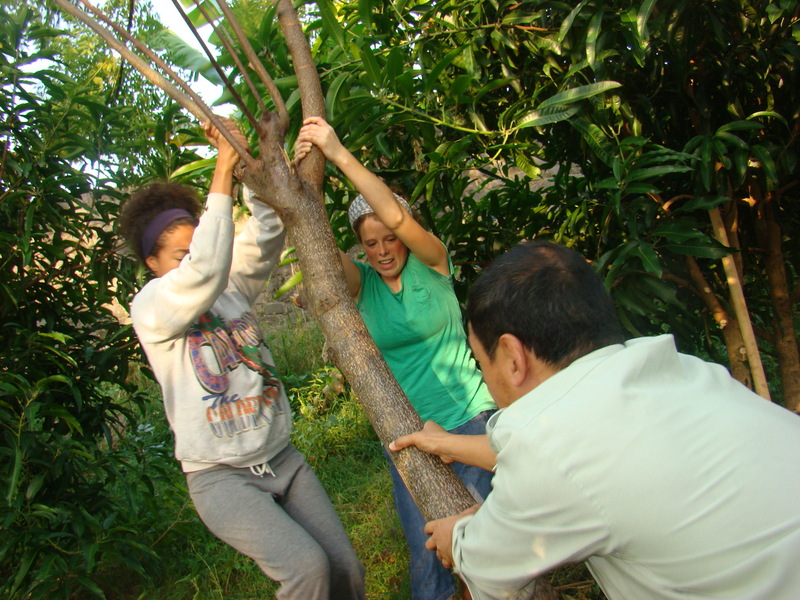 My final WWOOF visit was to a village outside Haikou on the island of Hainan. 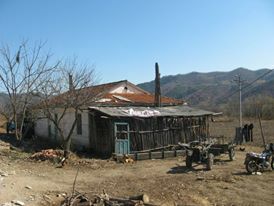 This older retired couple actually had urban citizenship, but decided to buy a house with a small farm in the countryside to escape city life. They were also a very safety-conscious couple, as demonstrated by my confinement to the inside walls of the farm compound. While this did hinder my observations of broader village life, I did not let it deter my 10-year daily run routine, even if I did feel a bit like a hamster on a wheel. Felling trees inside their compound; this was the one visit where one other WWOOFer happened to be their first visitor along with me! Ok that’s all for now, but stay tuned– I’ll be updating periodically over the next few weeks with individual posts and photos from each field visit. 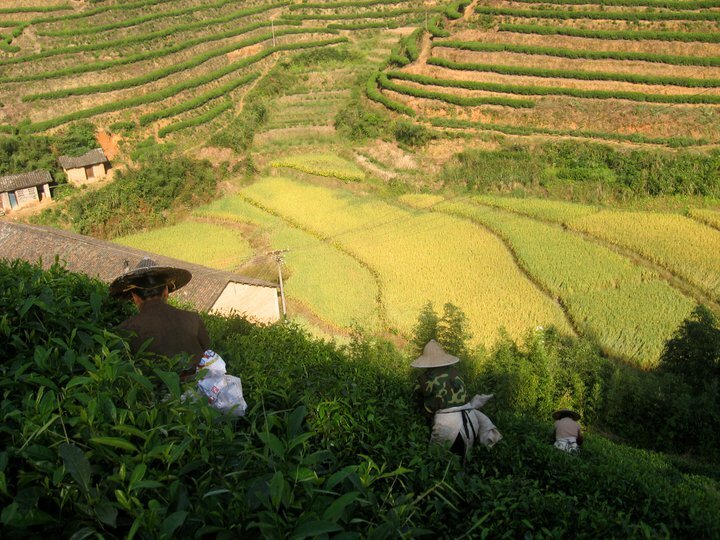 This entry was posted in Zhejiang Province and tagged rural China, Zhejiang. Bookmark the permalink. Elena, I appreciate both the narrative and the photos. 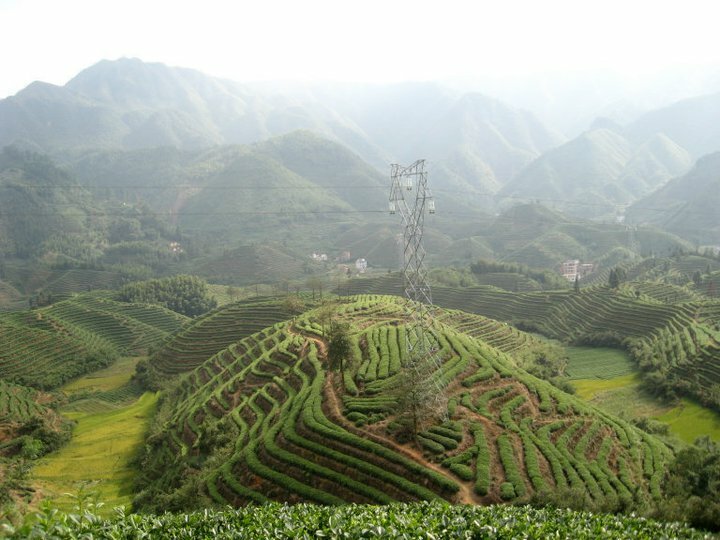 I know NOTHING about rural life in China, and the reports you are making are beginning to give me a little bit of the flavor of the places and the work everyone is attempting to accomplish. Being geographically-minded, I’m also glad that you let us know each of the provinces and towns where you are visiting and working. Then I can correlate that with a look at my World Atlas. You really get around! From Marty Walton, Quaker meeting, now living in Springdale!